For the bodybuilder or image-conscious person, the purpose of dieting is to improve one’s appearance by reducing body fat to reveal a healthy and impressive physique. Few people diet with the intention of losing muscle; certainly not bodybuilders and athletes. Unfortunately, most dieters suffer a balanced loss of both lean and fat mass due to extreme caloric restriction, excessive cardio, or unwise use of stimulant-based weight loss products and thyroid hormones.1 The physical and emotional stress can also disrupt sleep, which promotes fat gain and interferes with optimal hormonal balance. The preservation of muscle mass during hypocaloric dieting, especially in a setting of physical exercise or labor, is challenging. Not only must sufficient calories be consumed, but also amino acids to avoid limiting any anabolic processes. Dieters also need to manage their macro- and micro-nutrients necessary to support lean mass function, repair, and growth. The Atkins diet is not a true ketogenic diet in that it gradually re-introduces carbohydrates to the diet after an induction phase of variable length. However, the dramatic changes that occur during the ketogenic phase have caused that component to be the lightning rod of media attention. A parade of ketogenic-based diets followed. However, with time, it became evident that many individuals are unable to comply with the severe carbohydrate restrictions. Ketogenesis refers to the creation of small molecules called ketone bodies, primarily by the liver, when the body is desperate for energy, during periods of low sugar availability for calorie burning.3 Type 1 or insulin-dependent diabetics can experience a severe, life-threatening form of ketosis due to their inability to drive sugar into the active tissue that needs sugar-based calories, even though the bloodstream is practically syrup. Instead, stored fat is released in greater quantities, as well as protein from skeletal muscle to provide fuel for energy production. It is the metabolic equivalent to burning the furniture and hardwood floors to heat the home during a life-threatening freeze. Nutrients and growth factors activate mTOR; energy deprivation inhibits it.5 In other words, when the body is well-fed and growing, mTOR is “turned on;” conversely, when energy (most strongly affected by glucose availability to the cell) is low, mTOR is “turned off.” Bodybuilders are most interested in activating mTOR in muscle, as well as turning it off in fat tissue. Unfortunately, the natural signals are generally not tissue-specific, meaning that what increases muscle-building also tends to promote fat gain; the opposite is also true, to increase fat loss, one risks increasing muscle loss. This may account for some degree of the association of muscle loss during dieting. There is some research into pharmaceutical compounds that would be tissue-specific in activating or inhibiting mTOR. One of the most potent activators of mTOR is insulin, the hormone released when blood sugar goes up during a meal.6 Insulin rapidly stops the protein breakdown that can occur during strenuous exercise, especially when glycogen (stored sugar) levels are low in the muscle and liver, as well as increasing anabolic processes and glucose uptake. Insulin also promotes fat storage in fat tissue, so the challenge for bodybuilders is balancing and timing insulin surges to promote muscle gains as they maintain a low basal insulin presence. Bodybuilders may be familiar with the many high-carbohydrate creatine products, using as much as 75 grams of dextrose (sugar) to induce a high-amplitude insulin surge. In the relevant area of the brain and the liver, normal mice experienced a decrease in a factor that stimulates mTOR (Akt), as well as a factor that carries out the mTOR signal in promoting protein synthesis and cell growth (S6) while on the ketogenic diet. Also, a factor that inhibits mTOR (AMPK) was increased considerably. These effects were also seen in the mice subjected to the “epilepsy drug,” with reduced seizures in the ketogenic diet rats, suggesting that suppressing the mTOR pathway may be the way the diet helps epileptic children. Interestingly, the suppressive power of the ketogenic diet was greater than the stimulating effect of the “epilepsy drug” kainic acid, a mTOR hyperactivator. For those fortunate enough to be healthy, the question then arises: will following a ketogenic diet reduce muscle gains, or enhance muscle loss? Sadly, it appears this may be the case, particularly for drug-free bodybuilders. The authors noted that ketogenic diets resulted in much lower insulin concentrations in prior animal studies (an effect also seen in humans).7 Insulin is one of the more potent driving forces in activating mTOR (via PI3K and Akt). What about other growth factors, such as IGF-1? Like insulin, IGF-1 has a potent effect on mTOR activation. Studies in children on ketogenic diets have shown that they experience growth impairments both in height and mass.7,8 Analyzing the hormone profile shows this is closely-related to a significant decrease in free and total IGF-1. Blunting both insulin and IGF-1 removes two of the most potent activators of mTOR. One last major pathway leading to muscle loss, or at least reduced muscle growth, is myostatin. This hormone actually is a negative regulator of muscle mass; it promotes atrophy or muscle loss. Myostatin acts a preserver of (reduced) muscle function, reducing the amount of muscle and attempting to draw in more sugar through specific receptor-transporters (GLUT1, GLUT4, etc).13 This results in greater insulin sensitivity in the muscle, but seemingly fails to keep pace with the increase in insulin resistance caused by increases in stored fat and fatty acids inside the muscle cell. Myostatin activates the mTOR inhibiting pathway (AMPK), and reduces the mTOR activating response to insulin/IGF-1 (Akt).14,15 It is a vicious cycle, designed to allow the body to survive periods of famine. Very few cavemen were engaged in the sport of bodybuilding during the Paleolithic era; the genes in modern man are designed to store energy, not waste it. It should be noted that the insulin resistance that occurs during low-carbohydrate dieting is beneficial in that it reduces the competition for sugar for the brain. When the liver, muscle and other tissues are responding to insulin, they preferentially absorb sugar. Brain tissue is not insulin-sensitive, so it suffers temporarily when an insulin surge occurs. This is the sugar crash that causes suburban kids to go into a three-hour coma on Halloween, after gorging on fun-sized Snickers and Twizzlers. 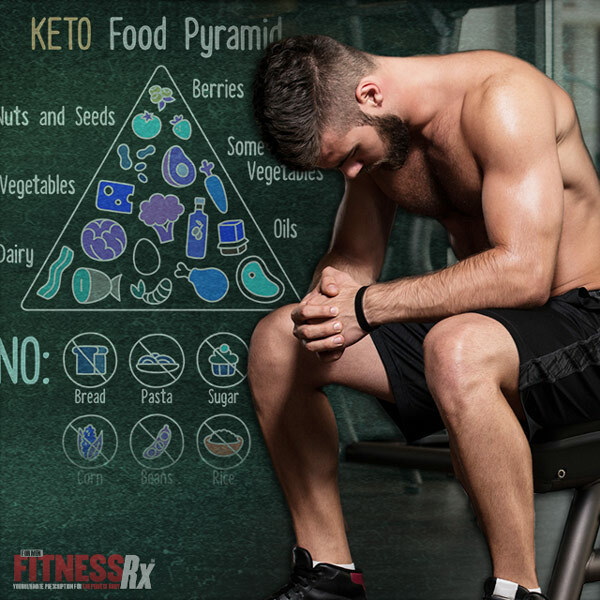 Even for a drug-enhanced bodybuilder, especially at the pro level where a small difference can be the difference between being “in the money” or standing back during the pose down, a ketogenic diet may be the minor but significant deficit. Some may increase the use of growth factors in an attempt to promote muscle growth or maintenance during this period (assuming their “guru” is aware of mTOR effects). However, as noted earlier— insulin use impairs fat loss; the liver is much less responsive to growth hormone, producing less IGF-1; and myostatin reduces the muscle cell’s sensitivity to mTOR activation and makes it more susceptible to mTOR inhibition. When dieting, people seek the fastest and most potent pathway to fat loss. However, for the athlete and bodybuilder, ketogenic dieting does not appear to be the optimal plan. Muscle loss is too high a price to pay and in the high stakes game of professional bodybuilding, the small difference may be all the difference. 1. Weinheimer EM, Sands LP, et al. A systematic review of the separate and combined effects of energy restriction and exercise on fat-free mass in middle-aged and older adults: implications for sarcopenic obesity. Nutr Rev, 2010 Jul;68(7):375-88. 2. Adam-Perrot A, Clifton P, et al. Low-carbohydrate diets: nutritional and physiological aspects. Obes Rev, 2006 Feb;7(1):49-58. 3. Finn PF, Dice JF. Proteolytic and lipolytic responses to starvation. Nutrition, 2006 Jul-Aug;22(7-8):830-44. 4. McDaniel SS, Rensing NR, et al. The ketogenic diet inhibits the mammalian target of rapamycin (mTOR) pathway. Epilepsia, 2011 Mar;52(3):e7-e11. doi: 10.1111/j.1528-1167.2011.02981.x. Epub 2011 Mar 3. 5. Matsakas A, Patel K. Intracellular signalling pathways regulating the adaptation of skeletal muscle to exercise and nutritional changes. Histol Histopathol, 2009 Feb;24(2):209-22. 6. Bolster DR, Jefferson LS, et al. Regulation of protein synthesis associated with skeletal muscle hypertrophy by insulin-, amino acid- and exercise-induced signalling. Proc Nutr Soc, 2004 May;63(2):351-6. 7. Yamada KA. Calorie restriction and glucose regulation. Epilepsia 2008 Nov;49 Suppl 8:94-6. 8. Neal EG, Chaffe HM, et al. Growth of children on classical and medium-chain triglyceride ketogenic diets. Pediatrics, 2008 Aug;122(2):e334-40. 10. Hayashi AA, Proud CG. The rapid activation of protein synthesis by growth hormone requires signaling through mTOR. Am J Physiol Endocrinol Metab, 2007 Jun;292(6):E1647-55. 11. Drummond MJ, Fry CS, et al. Rapamycin administration in humans blocks the contraction-induced increase in skeletal muscle protein synthesis. J Physiol, 2009 Apr 1;587(Pt 7):1535-46. 12. van Loon LJ, Goodpaster BH. Increased intramuscular lipid storage in the insulin-resistant and endurance-trained state. Pflugers Arch, 2006 Feb;451(5):606-16. 13. Chen Y, Ye J, et al. Myostatin regulates glucose metabolism via the AMP-activated protein kinase pathway in skeletal muscle cells. Int J Biochem Cell Biol, 2010 Dec;42(12):2072-81. 14. Glass DJ. PI3 kinase regulation of skeletal muscle hypertrophy and atrophy. Curr Top Microbiol Immunol 2010;346:267-78. 15. Morissette MR, Cook SA, et al. Myostatin inhibits IGF-I-induced myotube hypertrophy through Akt. Am J Physiol Cell Physiol, 2009 Nov;297(5):C1124-32. 16. McCarthy JJ, Esser KA. Anabolic and catabolic pathways regulating skeletal muscle mass. Curr Opin Clin Nutr Metab Care, 2010 May;13(3):230-5. 17. Trendelenburg AU, Meyer A, et al. Myostatin reduces Akt/TORC1/p70S6K signaling, inhibiting myoblast differentiation and myotube size. Am J Physiol Cell Physiol, 2009 Jun;296(6):C1258-70. 18. Deldicque L, Theisen D, et al. Regulation of mTOR by amino acids and resistance exercise in skeletal muscle. Eur J Appl Physiol, 2005 May;94(1-2):1-10. 19. Bolster DR, Jefferson LS, et al. Regulation of protein synthesis associated with skeletal muscle hypertrophy by insulin-, amino acid- and exercise-induced signalling. Proc Nutr Soc, 2004 May;63(2):351-6. 20. Langfort JL, Zarzeczny R, et al. The effect of low-carbohydrate diet on the pattern of hormonal changes during incremental, graded exercise in young men. Int J Sport Nutr Exerc Metab, 2001 Jun;11(2):248-57.